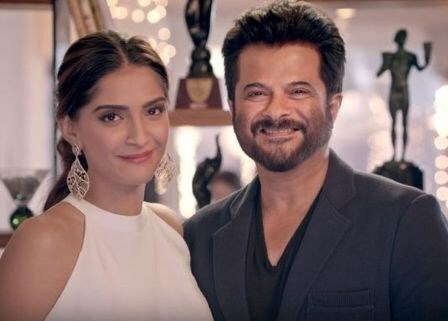 Actress Sonam Kapoor will be seen sharing screen space with dad Anil Kapoor in forthcoming “Ek Ladki Ko Dekha Toh Aisa Laga” says his father was scared of him on the sets. Sonam Kapoor was interacting with media during the trailer preview and Anil Kapoor’s 62nd Birthday celebration here in Mumbai. Sharing screen space with a veteran actor father could be a daunting task for newbie actress, but Sonam Kapoor says with her the story was different. Talking about working with her father in the film, she said, “Apparently dad was sceptical on set, that’s what he told my sister Rhea. It was a double celebration as December 24 also marks the birthday of “Mr India” actor. Anil cut the birthday cake at the event amidst the presence of media and the film’s cast. Sonam Kapoor had a terrific 2018 in-terms of career, as her back to back three movies, such as Pad Man, Veere Di Wedding and Sanju, did magical numbers at the box-office. “ELKDTAL” is directed by Shelly Chopra Dhar. It stars Anil Kapoor, Juhi Chawla, Sonam Kapoor and Rajkummar Rao in the lead roles. The film also features Regina Cassandra and Madhumalti Kapoor in crucial roles. The trailer for the film will be out on 27th December and film releases on 1st Feb 2019. माता-पिता की सालगिरह पर भावुक हुईं प्रियंका, शेयर की तस्वीर!